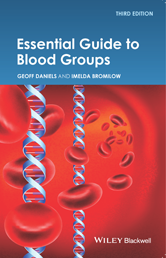 Essential Guide to Blood Groups is the only pocket sized guide to provide essential information on blood group systems. The main aim of the blood transfusion laboratory is to promote safe blood transfusion. The avoidance of errors, from sample receipt and laboratory testing through to the release of blood for transfusion, is of paramount importance. What is the difference between sensitivity and specificity and how can these be determined? Why is anti-A,B no longer obligatory in ABO typing? Why are two anti-D reagents often recommended for RhD typing? What is the importance of detecting D variant (weak D and partial D) phenotypes? How do I control the results for antiglobulin testing? Why should RhD positive women be tested more than once during pregnancy? How often should transfusion recipients be tested for the presence of antibodies? How can passive anti-D be differentiated from anti-D due to alloimmunisation? Why do we need to perform antibody screening? Isn't a crossmatch by IAT at 37°C enough to detect incompatible blood? What is the incidence of alloimmunisation post-transfusion? How do I determine and identify antibodies present in a sample? What is a compound antibody? How can the incidence of compatible donors for a recipient with multiple antibodies be calculated? Why can't the droppers in bottles of reagents be used instead of a volumetric pipette? What cells should be used when performing an antibody titration? How are the results of titrations reported? What is a Major Obstetric Haemorrhage? When group-specific blood is in short supply, how do I select the ‘next best’ for transfusion? How are high-titre haemagglutinins classified? What is an ‘immediate spin’ crossmatch? What is an ‘electronic crossmatch’? Which patients are not eligible for electronic issue of blood? What are signs and symptoms of a suspected transfusion reaction? What action should be taken in the event of a suspected transfusion reaction? In haemovigilance, how should ‘near-miss’ events be characterised?